Does miracle exist? This would be a tendency of anyone who is caught in critical situation when help is beyond reach to expect for a miracle to solve the situation when everyone is totally desperate and lives are endangered. Ten thousand of people were reported missing and dead as the Super Typhoon "Yolanda" heavily hit the Eastern Visayas by her 275 kph gusty winds strength. Typhoon "Yolanda" ravaged the place at around 12 noon. Public weather storm signal # 4 raised over the provinces of Samar and Leyte. 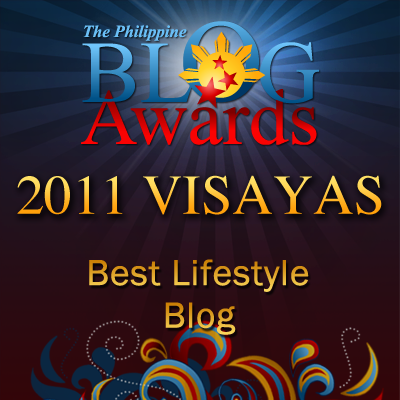 The city of Tacloban was hardest hit, leaving everything standing to topple down. All means of communication were paralyzed. The residents were totally devoid of foods, water and shelter. At the height of typhoon's wrath, everyone in that area is on his knees praying and hoping for a miracle to happen. The missionary work of The Church of Jesus Christ of Latter-day Saints in the Tacloban Mission was suspended on that fateful day. Every missionary in that area was accounted for and was ordered by the Church general headquarter to be "pulled out" from their respective assigned area immediately. Obedient as they are, those missionaries both the elders and the sisters left their apartment in a hurry, leaving all their luggages. They only brought along with them their scriptures. They're transported to the mission home by a minicab provided for them late at night. La Carlota District was worried about the safety of our female missionary, Sister Kitchie S. Agreda assigned to Tacloban mission for we had not received any communication from her through her family here in our place not until she called up her elder sister, Kat about her situation out there. On November 13, Sis. 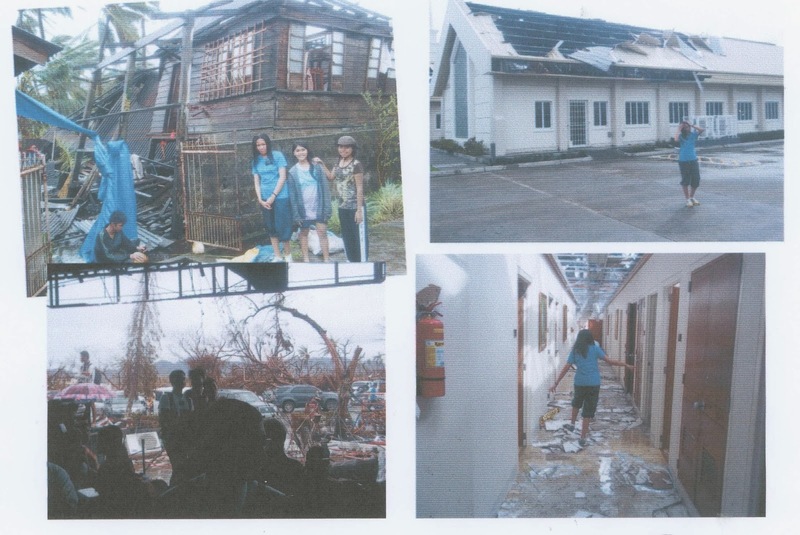 K. Agreda emailed her elder sister on how she survived the horrible wrath of Typhoon"Yolanda". She relayed her traumatic experience especially in Carigara area. No flood, but all the trees, residential houses, building were al destroyed. Sad to note, her bishop's house was caught by fire Sunday. Even the Church meetinghouse and her apartment were destroyed. At 1am Friday, Sister Agreda and her companion, Sister. Ralph were awakened and alarmed by the whoosh of strong wind outside. They peeped outside their apartment and saw nearby houses blown away, even those the concrete edifice; more roofs were detached and thrown away. Big trees were toppled down. Saturday, Sis. Agreda with her companion visited the Church meetinghouse which was partly damaged. In the afternoon, while they're doing some laundry in their apartment, the couple missionary, Elder Maxfield and his wife fetched and informed them that they'll be pulled out and will just bring one bag and some important things. They began to panic. All missionaries in that area were fetched and gathered in the mission home. By 11 pm, they were transported to Tacloban City. No one said a word for they're all obedient. By 12midnight, while traveling, they saw severa people at the center of the road hauling several sacks of NFA rice by their trisikad, jeeps, motorcycle, and even motorized tricycles. They're unable to pass through for almost 30 minutes. They reached Tacloban City for 3 hours for they got a flat tire along the way. Upon reaching, Palo, a historical place where Gen. Douglas McArthur landed, a body of corpse was seen along the road. Alas, they got a flat tire. Sis. Agreda's fear was overcome when Sis. Ralph hugged her tightly. They reached the main highway bearing the stinging foul of the dead bodies sprawling the road. All over the road broken glasses, wreaked cars, dead bodies were seen. 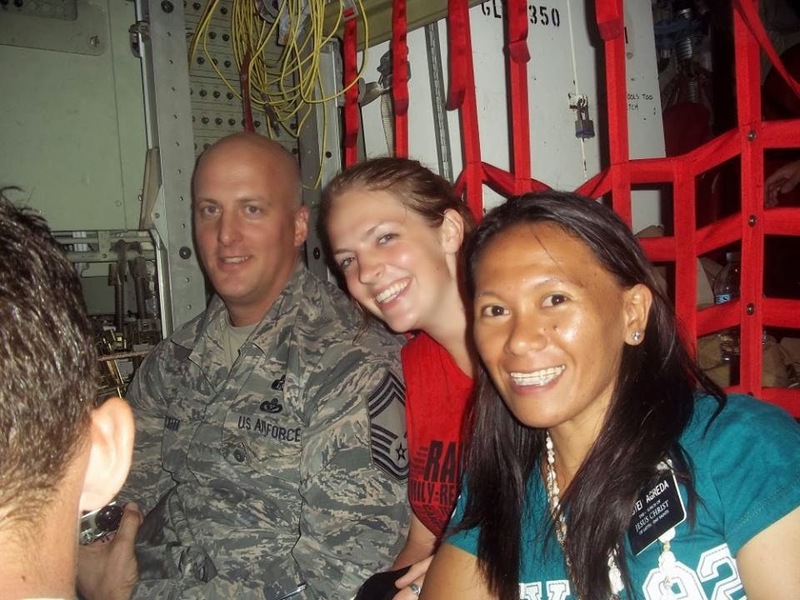 They're relieved when they reached the mission home and were warmly welcome by their mission president and wife and kids. Their mission president hugged them one at the time. She couldn't believe herself of that horrible situation she had experience. She said they're like the refugees. They stayed overnight there and by 4am they headed to Tacloban airport. All the sisters were aboard the service vehicle while the elders took a walk in going to the airport braving the continuous pouring of the rain. They kept all their mouth closed for they might be noticed by the people out there and they might hurt them or mob them. They're all obedient. No one went against the instruction. There at the airport they waited for 3 hours. There were civilians there too waiting for several hours. They're quite assured for their security for there are police stay vigilance for any untoward incidence. Their patience was put to a test. All of them weren't accommodated for the plane for there are a lot of passengers. Only some of the missionaries were lifted for the 9am flight. 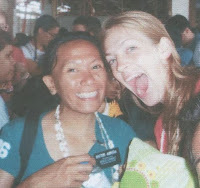 The Carigara zone missionaries whom Sister Agreda and Sister Ralph belong were advised to get back to the mission home for the next scheduled flight. First counselor of Area Presidency, Elder Ardern arrived at the mission home. Elder Ardern spiritually assured them that the First Presidency is mindful of their safety. He just followed the order of 2nd Counselor President Uchtdorf of the First Presidency to "get all the missionaries and get out immediately". Communication hinders to contact others, but yet the Church leaders are doing their best to save them. Their plane reservatioon was booked twice, but no chances that they'll be accommodated for they're many people waiting for their turn to be flown. Pres. Ardern assured after he arranged with the airport for their schedule. After an hour, no assurance. He just asked if they do believe in miracle. Everybody raised their hands. A marine army from US who is a member of the Church let us, 21 missionaries from Carigara zone to aboard the C130. We couldn't explain how we feel. The only thing we say is that our Heavenly Father is mindful of us. We have the ever-supportive Mission President Andaya who never sleeps just to keep us safe. 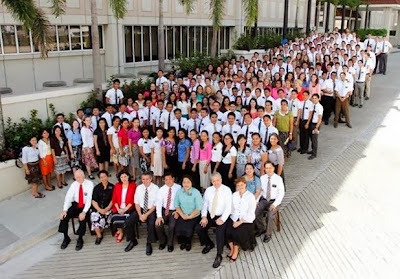 205 missionaries arrived in Manila Training Center in Manila safe and sound. In Monday, these missionaries will be reassigned to 7 mission in Manila Mission. She wrote, "I know this is the most traumatic event in my life that ever happened but it's the Lord's will. we can't question it but charged to experience. We have to give heed to our leaders even though they've weaknesses but they are caled of God. We are grateful we have the truthfulness of the gospel. we have the Book of Mormon. It can be read in the 3rd Nephi chapters 8-9 what had happened to the ancient people. "This is serious and this is a reminder not only in Tacloban but all the people to repent and to continue to have faith and trust our Heavenly Father. Miracles do really happen. This is what our Heavenly Father wants us to do to trust Him. Whatever happens He will truly spare our lives, and what we've witnessed that "No unhallowed hands can stop the work from progressing" and it is really true. "I testify, brother and sister. Heavenly Father lives and Jesus died for our sins and they will keep their promises for us and those blessings are for us. They loved us so much. 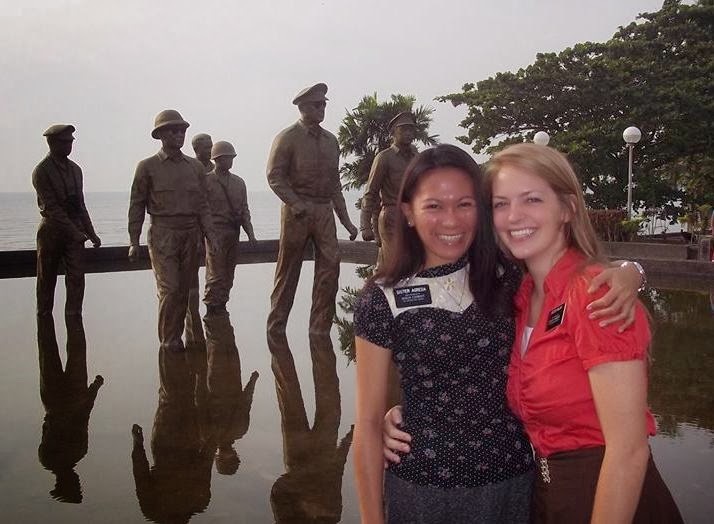 I love being a missionary. Everyday I love being a servant of my Heavenly Father." We can always believe in miracles but I think people whose relatives and friends have died because of the tragedy can hardly keep their faith. Some might even lose trust in God. That's bad but somehow the reality. God is really good! Glad they were okay but I can't imagine myself if I were in their shoes. Seeing dead bodies along the road while enduring its stench is really traumatic. This are the inspiring stories that should be flowing in the news stream rather than the continues complaining and bickering of people. it was really heartbreaking to see people suffer from this kind of ordeal, but it is also heartwarming to read this kind of miracle happening. it teaches us to always have faith in our Creator as He will surely save us from all harm. My Religion teacher told us before that it is indeed hard to trust someone that you cannot even see especially if unfortunate events happened. Yes, those unfortunate events are really traumatic and will heighten the issues regarding trust but once you really keep your faith to God then at the end of all the sufferings there will be comfort and assurance of seating beside Him.